The Oklahoma State Employee Health Insurance Review Working Group recently released a study aimed at reducing health insurance costs. The report, prepared for the working group by Milliman, Inc., was requested to examine the functions of the Employees Benefit Council (EBC) and the Oklahoma State Education and Employees Group Insurance Board (OSEEGIB) and to determine if a duplication of efforts existed between the two agencies. "In this budget environment, it is more important than ever that we eliminate duplicative efforts to ensure our tax dollars are used as efficiently as possible," said House Speaker Chris Benge, R-Tulsa. "The recommendations in this report would go a long way toward lowering costs to the state while maintaining, or in some cases improving, health care services to our state employees." The study examined current practices and made recommendations for the most cost-efficient and cost-effective way to leverage state dollars to ensure the highest level of health care for state and education employees at a competitive price. "I have been long advocating that we examine each and every state agency in state government to bring greater efficiencies for the taxpayers, and this exercise has been a good example of that," said Senate President Pro Tem Glenn Coffee, R-Oklahoma City. "I am hopeful this will allow us to use our purchasing power as a state to reduce or better manage costs for those state employees who are struggling with health care, and ultimately deliver a better deal for the taxpayers." The recommendations include integrating the two agencies to allow them to better focus on the health and wellness of state employees. "This report represents an independent third party analysis of how benefit plans are designed and administered in our state," said Insurance Commissioner Kim Holland. "The recommendations offered will save taxpayer money, lower costs, and improve the health and health benefits of our state employees." I will be working with DHS, the Department of Mental Health and the Adoption Review Task Force to help these families find some relief. I continue to take comments regarding these cases so please feel free to contact my office if you would like to share your thoughts or experiences. The current budget crises will make it difficult to adequately address these cases until state revenue begins to increase. It’s important to understand these types of cases are not limited to adopted children and a more comprehensive solution is needed to protect families and society. OKLAHOMA CITY – Phillip Smith calls himself a concerned citizen representing Oklahomans who want a free market health care system. He spoke at an interim study today about why he believes they must help make the system more consumer-driven. Smith said the health care system has been a third party payer system, with the third party being either the government or private insurance. Giving individuals the same tax breaks as companies for purchasing health insurance will begin a journey towards a system with more consumer choice and lower costs, he said. State Rep. Jason Nelson, who requested the study, said he favors individual health insurance tax relief but wanted to study how feasible implementing it would be. Nelson said he plans to introduce legislation to create tax credits for individuals to give them greater power and options in purchasing health insurance. He said he will draw on today’s presentations to help shape the legislation. 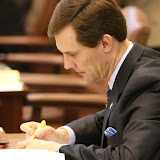 When Nelson filed a similar measure in the 2009 session, it was estimated the legislation would benefit up to 1.18 million Oklahoma families and individuals who would have been allowed to deduct about $2.23 billion in health insurance premiums, saving an estimated $85.9 million in taxes and increasing their ability to buy better coverage. Tom Daxon, a certified public accountant and the author of an Oklahoma Council of Public Affairs study on health care reform, urged lawmakers to support Nelson’s plan. He said that regardless of the outcome of the national debate, employers are going to be under increased pressure that will likely result in higher deductibles and lower quality of health coverage. Giving individuals more power to buy their insurance outside of what their employer offers is the right direction, he said. Smith said he looks forward to the Legislature taking an active role on the path to a free market health care system. “Representative Nelson’s tax credit plan will start the process of building a true consumer-driven health care system,” Smith said.